Hi Mamas! 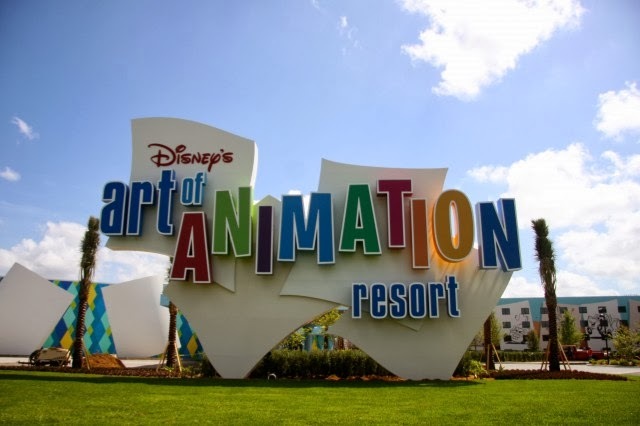 Today I am taking you for a visit to my favorite value resort-The Art of Animation! This is Disney’s newest value resort. First up let’s talk about the rooms. It offers family suites, themed as the Lion King, Cars, and Finding Nemo. 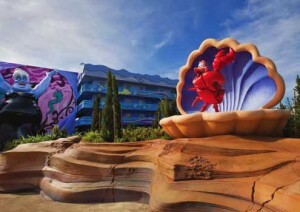 Finding Nemo tends to be the most popular because of the location. 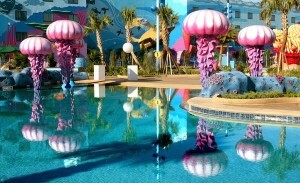 They are closest to the main building and the feature pool. 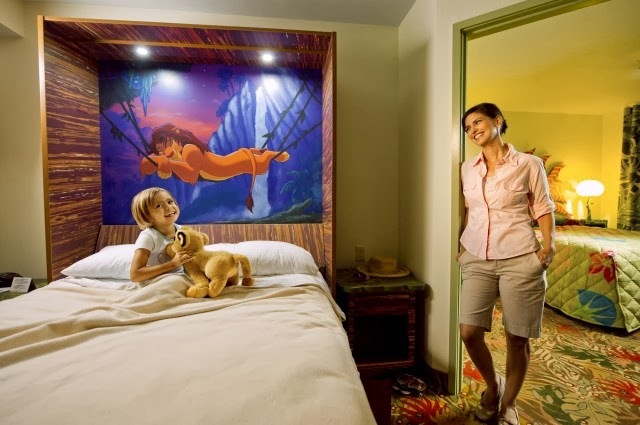 I do think this murphy bed design in the Lion King rooms is pretty cool. 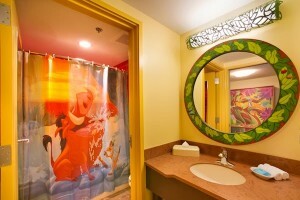 Even the bathrooms are themed for the rooms! 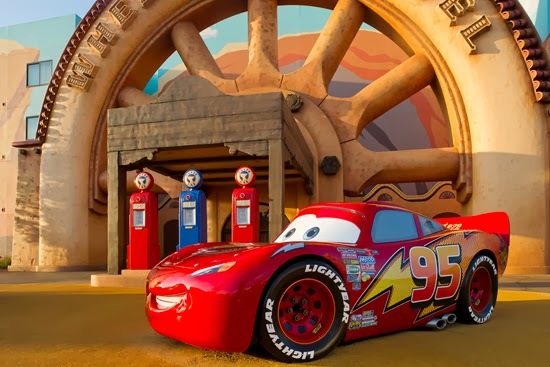 I personally think that the Cars section is themed the best overall. Of course I have two boys who are obsessed with Cars so I might be a bit biased. 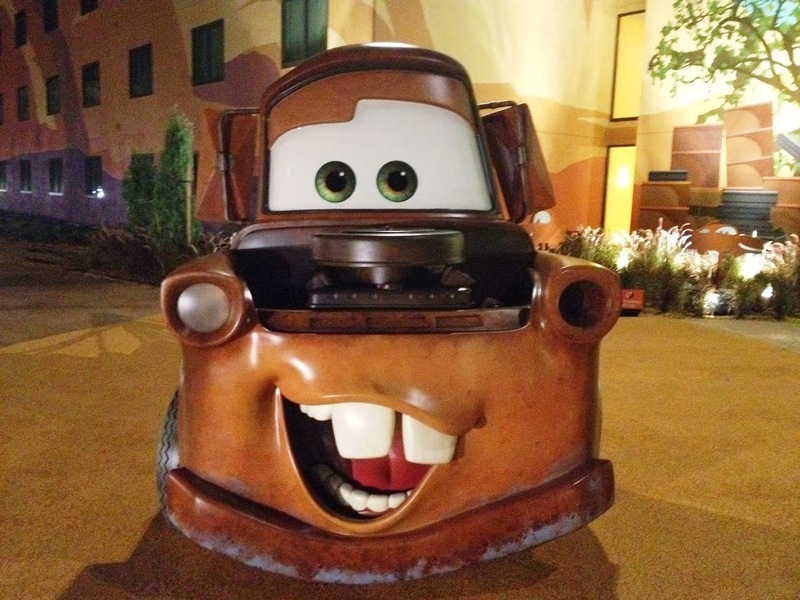 Our boys stopped to say good night to every Cars character every night of our stay there. The family suites have a master bedroom with a queen bed, a living room with a pull out sofa, and a dining room with a murphy bed. The best part of this besides the door that allows the parents to sleep in peace, is there are two bathrooms! Very nice for families. Overall I loved the space that these offered. We never once ate at the dining room table though so for our family the murphy bed stayed down the entire time. The kids prefer to eat in front of the tv on vacation and I let them because it’s vacation. 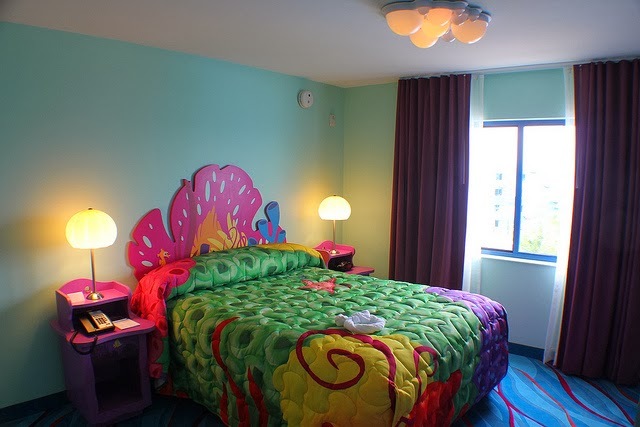 In addition to the the family suites there are standard rooms that are themed for the Little Mermaid. These are not too girly at all. One thing to note about this resort is the Little Mermaid rooms have been excluded from every discount since they opened. I personally would opt for another value during a time when a discount is released compared to paying more to stay in these rooms without a discount. The family suites have almost always been included! The Little Mermaid rooms have two full sized beds in them like the other values. Now moving on to the pools. The Finding Nemo pool is by far the nicest feature pool of all the value resorts. There is plenty of play areas for the littlest of Disney fans and there is music piped in under the water. Just what you imagine Nemo hears when he’s at home in the ocean. They also have a nice pool bar as well and show movies here like the other pools do. Each themed section has a pool too. Now there are a few negatives. 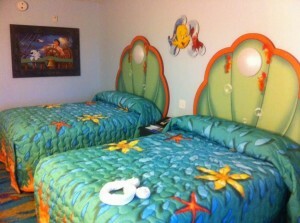 I’ve mentioned the biggest negative in regards to the Little Mermaid rooms and the lack of discounts offered for those. The other negative I encountered was the cell phone coverage was awful. 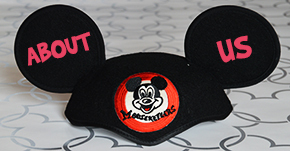 It was the worst I have experienced at Disney. There is definitely a design flaw here. I had to go outside of the building to make phone calls and then you get the outside noise of families running around on vacation. I couldn’t get emails very successfully on my phone either while in the room which in our business is critical. At the time of our stay the resort did make up by allowing free phone calls from the room if you spoke to them about the situation. I am not sure if they still will do that or not. 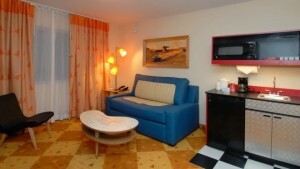 There are plenty of other positive features that make this our family’s top choice of the value resorts. 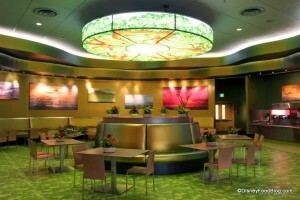 One of which is the Landscape of Flavors quick service restaurant. (photo courtesy of Disney Food Blog) It’s huge and accommodates plenty of people. The menus offer a wide variety of options so even the pickiest of eaters is satiated. It is conveniently located to any of the buildings you are in. I also like that this resort doesn’t share a bus with any other resort. 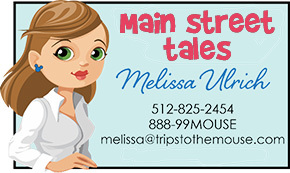 It is really nice to have a one stop shop so to speak when it comes to the transportation. I love the theming throughout the resort. I really feel like it brings some of the Disney movies to life.